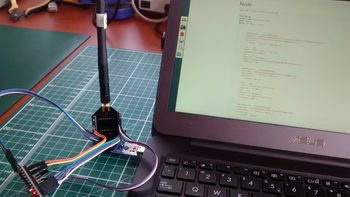 This page describes the steps needed to create a simple LoraWAN node for the-things-network, using an Arduino Pro Mini and a HopeRF RFM95 module. It doesn't currently contain any new work, it just describes the steps I've done to use existing code to get a LoraWAN node to work with a LoraWAN network. I've tested this successfully on the-things-network (TTN) in the city of Utrecht and on two gateways during a meetup of the Haagse Makers on 2016-05-10. On the Arduino side, every time a packet has been successfully sent, you'll see a message containing "EV_TXCOMPLETE" on the serial output of the Arduino. On the TTN side, you can go to http://thethingsnetwork.org/api/v0/nodes/YOUR_DEVICE_ADDRESS where you should see the contents of the message you just sent, along with information about the particular gateway that received your signal, received signal strength and with what settings (bandwidth, spreading factor) your packet was received. Basically this connects the RFM95 to the SPI bus of the Arduino, connects the RFM95 to 3.3V power and connects some of the generic RFM95 I/Os (like interrupt signals) to the Arduino. I don't know if connection of all the DIOx pins is really needed. At least DIO2 on the RFM95 seems to be used exclusively for some frequency-hopping feature (which is AFAIK not used in LoraWAN), I guess you can ignore that signal. This section assumes you are running Linux (I've tested this with Debian Jessie) and that you have git already installed. The firmware used on the arduino is the nano-lmic-v1.51-F.ino from the examples directory of the LoRa LMIC library. in the library: replaced all instances of "arduino.h" by "Arduino.h" (capital "A"). This was needed because I compile on Linux which uses case-sensitive file names. When running this code, you can see some debug messages coming in over the serial port at 115200 bps. While taking the train from Leeuwarden to Gouda, I decided to transmit from the train onto the LoRa gateways in the neighborhood of Utrecht on the way home. This was also a test for me for the device registration process, see also this ttnctl quickstart. I registered another personalized device. I didn't need to do any reversing of bytes or anything like that, just copy the hex string into the Arduino code. WARN Sending data as plain text is bad practice. We recommend to transmit data in a binary format. The payload field is your data, unencrypted just encoded as BASE64. In this experiment, I modified a Things Uno (actually a Leonardo!) with an external antenna and reprogrammed it with code for ttnmapper.org. I put a 100 pF capacitor in series to the external antenna, perhaps I should have just bridged (0 ohm) the connection. To see the scan result from a little bike tour around the gateway, go to ttnmapper page and zoom into Gouda, around the train station. The point of this experiment is to create a simple LoRa node that is actually somewhat useful. The idea is to attach a cheap PIR motion detector module to an Arduino and make it send a LoRa signal when motion is detected. This page was last modified on 24 April 2019, at 13:02.